Thallus pale greenish gray to white or sometimes orange; epilithic or mostly endolithic with scattered epilithic verrucules, up to 0.4 mm thick, even to weakly verrucose, or rugulose, subrimose on thicker thalli; prothallus black, sometimes present; esorediose. 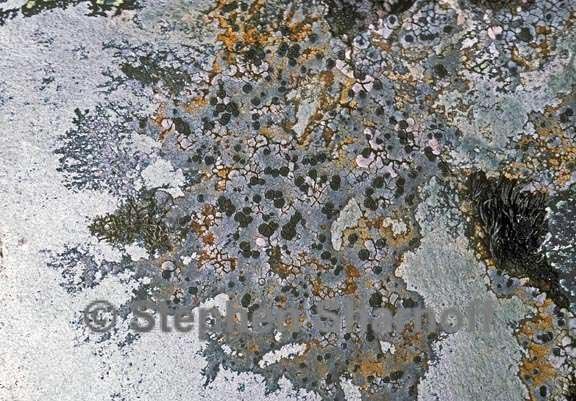 Apothecia scattered, broadly sessile, to 2 mm broad, usually about 1,2 mm; margin thin, bare, even to weakly flexuous; exciple of conglutinate, branched rows of oblong cells radiating from hypothecium, dark brown to blackish at margin, the cells 4.5-7 μm; disk black or brownish black, bare; epithecium brown, olive, or commonly green; hymenium 70-110 μm; spores 13-20 x 7-10 μ. Reactions: K+ red or yellow or K—, C-, medulla I—. Contents: accessory stictic acid, crypto-stictic acid, constictic acid, norstictic acid, and two unknowns (Gowan 1989). This species usually grows on acid rocks in the open. It is known so far only from North America, where it ranges from the Arctic, to the alpine in Colorado and along the coast to California. This species resembles P. macrocarpa but differs in having more elongate, slightly thicker and more deeply colored excipular cells, a slightly lower hymenium on the average, smaller spores, and an arctic-alpine distribution. Gowan (1989) also points out that the blue pigment below the hypothecium characteristic of the P. macrocarpa group is rarely found in this species.